January 30, 2019 February 7, 2019 - by Paul Farol - 6 Comments. 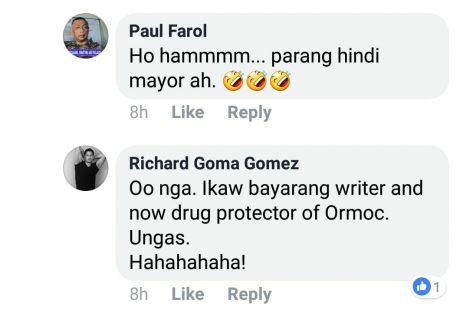 People in Ormoc City literally cannot complain about their Mayor Richard Goma Gomez. Unlike here in Metro Manila where citizens can freely criticize and even lambast our public officials, Mayor Gomez intimidates and harasses Ormocanons who bring up legitimate issues about his governance into silence. But why take the cudgels for people who actually elected Gomez as mayor? It’s simple really. I believe in speaking up for those who cannot speak for themselves and seek justice for those being crushed. 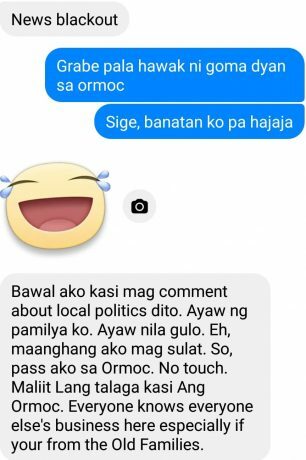 Someone on Facebook who claims to live in Ormoc City sent me a message on Facebook thanking me for exposing the failings of Gomez’ governance because they couldn’t write about it on social media for fear of reprisal from the mayor. I can’t fault this Ormocanon for keeping quiet about Mayor Goma’s bungling and corrupt regime in one of the richest cities in Leyte. After all, this person’s entire family and livelihood could be endangered even by merely hinting that there’s something wrong about the mayor’s rule. People there have told me about businesses being harassed and citizens being picked up by goons, who then turn up later with crushed fingers and feet. But even if one is in Metro Manila, one isn’t safe from Mayor Gomez’ attempts to intimidate and harass people into silence — including me. 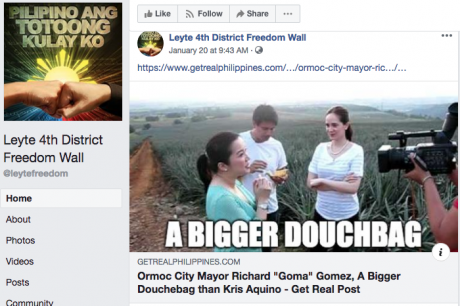 About two weeks ago, I wrote about an apparently corrupt project which was initiated by Mayor Gomez and it got posted by a page called Leyte 4th District Freedom Wall. Given how the spirit of the times focused on her feud with the Falcis brothers, the title “Ormoc City Mayor Richard Goma Gomez, A Bigger Douchebag than Kris Aquino” was intended to draw attention to the plight of Ormocanons who couldn’t speak up for themselves lest their feet get rifle butted by Gomez’ goons — something which Krissy is not yet capable of having done. In that post, I wrote briefly about how Mayor Gomez harassed and intimidated Ormoc City Treasurer Delia Vilbar after she refused to release a check worth P10 million for a project that had not yet passed through proper bidding. 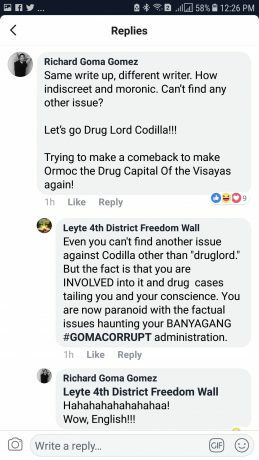 Instead of addressing this issue of why he wanted his city treasurer to break anti-graft and corruption laws to release a check for a project that had not yet been bidded out, Mayor Gomez accused me of being a drug lord protector and accused his political rivals of being drug lords in the comment section of Leyte 4th District Freedom Wall’s post. It would have been better for Gomez to have addressed the issue squarely first before accusing his political opponents of being drug lords. 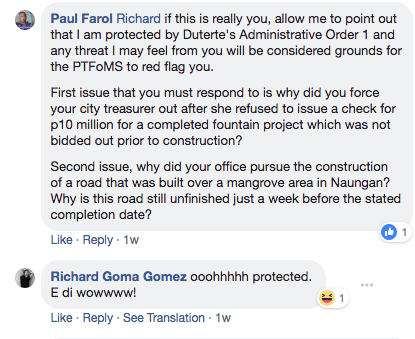 Instead, Gomez’ response makes him look like he is deflecting the issue because he really can’t explain why he harassed and intimidated Vilbar for not issuing a check for a project that had not passed bidding requirements. His subsequent comments made him look like a thief that had been caught in the act. Honestly, when I saw his comments I first doubted that it was really Mayor Gomez who was writing the comments. But I was later convinced by mutual friends on Facebook that it was really Gomez’ answering me through his Facebook account. Sensing acting like a jackass on Facebook wasn’t the extent of Mayor Gomez’ repertoire, I warned the mayor that making any threatening remark against a member of a legitimate media organization (which I still am) might be construed as a basis for being red flagged by the Presidential Task Force on Media Security. After that, I gave him another opportunity to answer the issues at hand. I said, “Richard if this is really you, allow me to point out that I am protected by Duterte’s Administrative Order 1 and any threat I may feel from you will be considered grounds for the PTFoMS to red flag you. First issue that you must respond to is why did you force your city treasurer out after she refused to issue a check for p10 million for a completed fountain project which was not bidded out prior to construction? Then, at some point during the exchange of comments, mayor Gomez goes right on ahead and issues a threat against me. The reason why believe that Mayor Gomez’ was threatening me is because people who expose serious issues about his governance either get run out of town like Vilbar, get harassed/intimidated into silence, or just “disappear”. Gomez, despite playing the hero in a number of his movies, seems far from being that in real life. A glimpse of what lies behind his facade was revealed when pages of a so-called blue book belonging to slain suspected drug lord Rolan “Kerwin” Espinosa turned up. 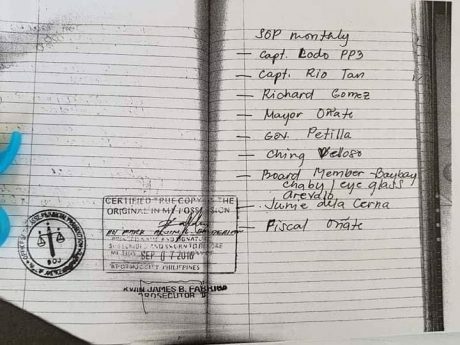 Along with former DOJ Secretary and now senator Leila De Lima, the bluebook listed the names of several other prominent politicians which included Mayor Richard Goma Gomez. Speaking to ANC, Chief Insp. Jovie Espenido, chief of Albuera Police, said they were aware of De Lima’s alleged involvement in the illegal drug trade even before Espinosa’s brother, Kevin, gave his statement. “‘Yung una pa, nung hindi sila mismo nagsabi ng ganun, noong umpisa nakuha na natin ‘yung mga blue book, mayroon nang ‘Ma’am De Lima’ na pangalan doon sa blue book,” he said. The blue book contains a list of the names of people who allegedly received drug money from Espinosa. Espinosa’s accountant, who listed downs the names, has also given his statement to the police. On its own, the so-called blue book (which some say is actually pink, the blue book being a reference to the Stonehill blue book which exposed corruption among government officials in the 1960s) would probably have little value as evidence. However, other affidavits supporting what was alleged in the blue book surfaced. 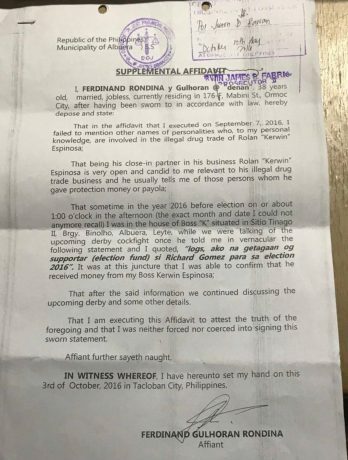 This one from Ferdinand Rondina Y Gulhoran which was received by Prosecutor II James B. Fabri, says then mayoralty candidate Gomez got election funding from Kerwin Espinosa. Sources in Ormoc say that Gulhoran has disappeared and people suspect that he may have already have been killed. So, it is in the context of what has happened to Vilbar and what may have happened to Gulhoran that I believe Mayor Gomez will attempt to silence me through “narco tagging” with the possible scenario of trumping up charges against me or perhaps even filing a libel suit which will contain the same narco tagging attempts. The People of Ormoc City are many; while the people of Richard Gomez are only few. They can also ask help from the national government, regarding this “corruption complaint’…where are they ? We are now like Italy, with its “Cosa Nostra and Mafia”, with government officials becoming the Mafiosi , themselves. It is only the people of Ormoc City, who can solve this problem. If they remain afraid of some “tin foil tyrant ” politician , or they fight for their rights to live peacefully, and not under fear ! This is why I wrote that celebrities should not be looked up to. Also, I wonder if Gomez could be described as among those ordinary (from a political perspective) people who got into politics and became corrupt, because that’s what they intended to do. The intention of everyone is to try to make your way up far above the ordinary and try as much as you can to align yourself among the elites of society even if it takes corruption. If you are a “mestizo” then you already have one advantage, by entering “showbiz” and creating yourself an image of being a good guy, once achieved the celebrity status and therefore the elite status, you would certainly don’t want to go back to being ordinary, in the elite perspective, being “poor”, and so the best way to secure this status is to enter politics and rule, that is the time where moral integrity breaks down and one becomes corrupt. Ordinary people are trapped in the world they do not own, they do not see their own world, they do not see their world as a “better/good” life, they only see the world of the elite, and this is what they see as a “better/good” life, extravagance, excesses and vices, and let us thank the late Robin Leach(Life of the rich and famous) for showing us of what being the “good” life is. Contentment will only come to to someone when they achieve the life of the elite, but when you are trying to achieve an illusion, there is no contentment. Speak what you think today in hard words and tomorrow speak what tomorrow thinks in hard words again, though it contradict every thing you said today.